Gerð is attested to in the Poetic and Prose Eddas, and Heimskringla. She is also attested to in various gold-leaf archaeological artifacts. She is a Jötunn, daughter of the frost giant Gymir and the mountain giant, Aurboða. As such, she is one of the primordial beings who represented the wild forces of nature that care little for the survival of humanity. She is the wife of Freyr, and through this marriage she is considered one of the Asyjnr, the major goddesses of Ásgard who receive worship. As a goddess of the Æsir, and distinct from other Jötnar, Gerð cares about the plight of mortals and is available through prayer and petition. In Heathen tradition, we are descended from the gods, they are our ancestors, and Gerð and Freyr specifically are the parents of human dynasties in Sweden. 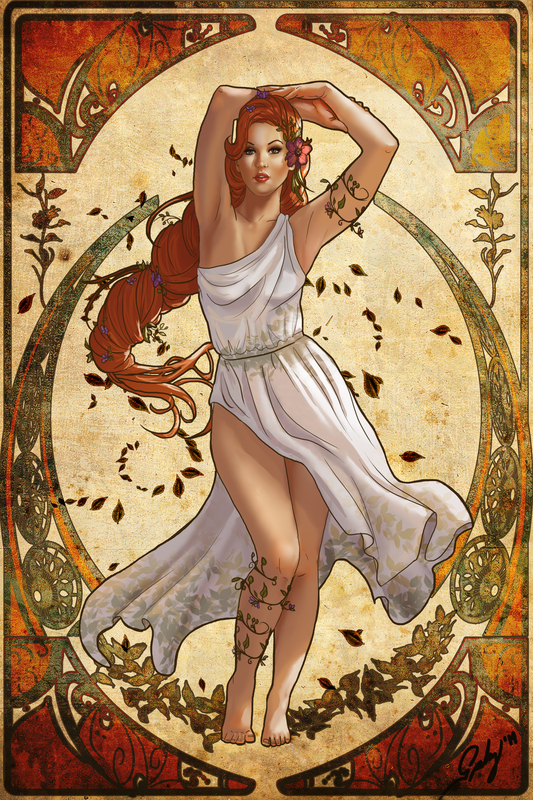 Her name means “enclosure,” or “fenced in.” She is considered the goddess of gardens, of soil and fertile earth, and the enclosures necessary to protect crops from pests. She is described as being exceptionally beautiful. So much so that she ensnared the lust and love of Freyr, previously the preeminent bachelor of the gods. In the lore, Freyr had snuck in to Hlidskjalf, the observation tower which allows Óðin and Frigga the vantage point to observe all happenings in all the worlds; and which is decidedly off-limits to all other beings. From it’s heights, Freyr spotted Gerð in Jötunheimr. In particular, he saw her arms shimmering and shining with light, which is compared in poetry to the glistening of sunlight on snow. So beautiful was Gerð that Freyr fell in love with her just by glancing at her elbows. He fell in love with her at first sight, but then immediately into hopeless despair, assuming that a match with her would be impossible. His step-mother, another jötnar-turned-goddess, Skaði worries about him and approaches the messenger god Skyrnir, to find out what is troubling Freyr. She asks him to further help him alleviate whatever it is. Skyrnir offers to help do whatever it takes to win the maiden, but only exchange for Freyr’s mighty sword, the sword which fights on it’s own! Without reluctance, Freyr agrees. Gerð rebuffs all of Skyrnir’s honeyed words, dismissing all of Freyr’s charms: his wealth, his warm personality, his golden farm-boy good-looks, his pedigree as a prince of the Vanir, his might as a warrior, and even his renowned masculine endowment and sexual prowess. Skyrnir offers her Draupnir, Óðin’s magic multiplying ring, Iðunn’s apples of eternal youth and beauty, and the wealth of the Vanir. No, no and no. Gerð will have none of it. After persuading, cajoling, begging and counter-offering, finally Skyrnir resorts to threatening, asserting that Freyr will curse Gerð with his “magic wand.” Gerð relents, and agrees to marry Freyr at the end of a 9-day courtship in a sacred orchard. While this story is sometimes seen in modern eyes as Freyr sexually harassing Gerð, the context of this tale is one of a long-standing war between the forces of creation (Ásgard) and the forces of destruction (Jötunheimr). The Jötnar are notoriously crotchety, bitter beings who delight in the destruction of all the gods’ creations, including their children – humanity and human civilization. Further, the tale is a poetic metaphor for the long haul from Winter to Spring, the aggressiveness life requires (Freyr) to push through the soil (Gerð) and meet the sun. In this tale, Skyrnir is the gentle, and then insistent, power of the sun to bring forth Spring. The months between January and spring weather in the northern hemisphere is a process which can try the patience of all. As such, Gerð is associated with the date which has become Groundhog Day, a day when we predict how long winter is going to drag on. This secular festival is also known as Imbolc in Celtic lands (and contemporary Wicca). Gerð is worshiped alongside Freyr, together as a divine couple. She symbolizes the frozen earth, which is warmed by the sun at the coming of spring, and then which is plowed and made fertile for the growing season. As such, the first sign of Winter breaking, associated with February 1-2 in Northern tradition is associated with her. 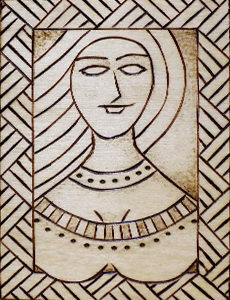 She is Skaði’s cousin, and is similarly a goddess of the cold. Her Anglicized name led to the phrase “gird your loins.” The character Gerda, in Hans Christian Anderson’s The Snow Queen gets her name from her. Fences, gates, garden sheds, and storehouses. Flower pots. Frozen earth and fertile soil. Gardens, farmland, orchards, and greenhouses. Crops. Sunlight reflecting off snow and water. Dating and courtship rituals. February 1st or 2nd: “the Charming of the Plough,” Groundhog Day, Imbolc and Candlemas. Gerda, Gerdhr, Gerth, Grið, and Griðr.